Ok, so a huge disclaimer is in order. I am going to compare two very different products and absolutely prefer one over the other. Of course, both are in my collection, both are similar in price, but one is probably going to break any day now and is not my first choice. 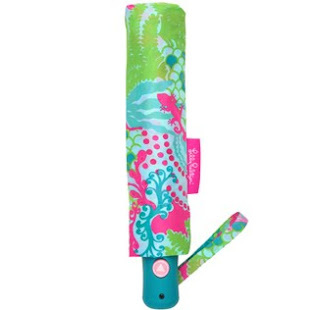 Earlier this spring, when Lilly Pulitzer collaborated with LeSportsac, I rushed to buy the mini umbrella. It is, well, pretty mini in size. 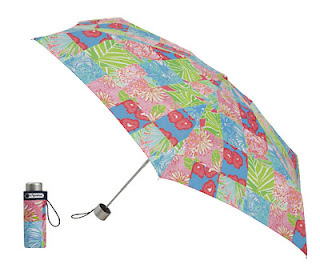 Initially, I was thrilled to have an umbrella in a Lilly print and loved the small size. It fits perfectly in any bag. The cute umbrella served it's purpose quite well. But then I saw the newest umbrellas from Lilly Pulitzer and I had a change of opinion. These umbrellas that are part of the fall stationery and accessories line, are much higher in quality than the LeSportsac umbrella. Immediately, I noticed that the umbrella seems much more sturdy and is larger in size. It can still fit easily in my bag. The print options are more to my liking, too. I finally decided on the Checking In print although White Zin is also one of my favorites. The price points of the two umbrellas are so similar that unless you need a micro small umbrella, I'd suggest the newest umbrella in Checking In or White Zin. A stronger umbrella can save you on a windy and rainy day! Have you seen both of these umbrellas? Which one do you prefer? I have the LeSportsac mini umbrella in the patchwork print as well. I love it because it is great for travelling! Also, in Germany, the rain has a tendency to come and go every 5 minutes, and you always want to have an umbrella on you. I love the mini because it can fit into almost any purse or even just a jacket picket. I adore the White Zin pattern and want the umbrella but am not sure if I can justify buying another one. I'd prefer the Lilly one in Checking In. Too cute! My mom looked at the leSportsac one and thought it would break in a minute, so she didn't get it! I have a Lilly umbrella from a while ago but its on its last leg so I'll be ordering one from lifeguard press! I just got my White Zin umbrella last night and noted how sturdy it seemed!! The pink of the White Zin print will DEFINITELY cheer me up on a cruddy, rainy, gray day!! I was upset when I heard Lilly was partnering with LeSportSac. I've always thought of them as 80's cheesy and not the best quality. Glad I didn't fold and buy the mini upbrealla. I need to pick up the other now that fall (and rain) are on their way. Glad to hear that the new Lilly umbrella is both bigger and better! I was so sad when I bought the LeSportSac one and it broke the first time I used it. And I love the White Zin print, so I'm psyched to go get the new one! Glad I didn't cave and buy the Le Sport Sac version. The other sounds much better! Checking In is my favorite pattern (my agenda is in Checking In).